Accommodation camps are being set up at key sites as more than 400 Queensland Rail employees and contractors push ahead with efforts to repair the Mount Isa Line railway track. Queensland Rail chief executive officer Nick Easy said the repairs – spearheaded by a project taskforce – were on schedule, with good progress continuing to be made. “On Monday (4 March) our crews deemed the Richmond to Hughenden section open for all rail traffic, following final repairs to 50 damaged sites spanning 100km,” Mr Easy said. “We are now working closely with our freight operators and their customers on options to restore services through this section and opportunities for freight to be loaded on and off trains at both Richmond and Hughenden. 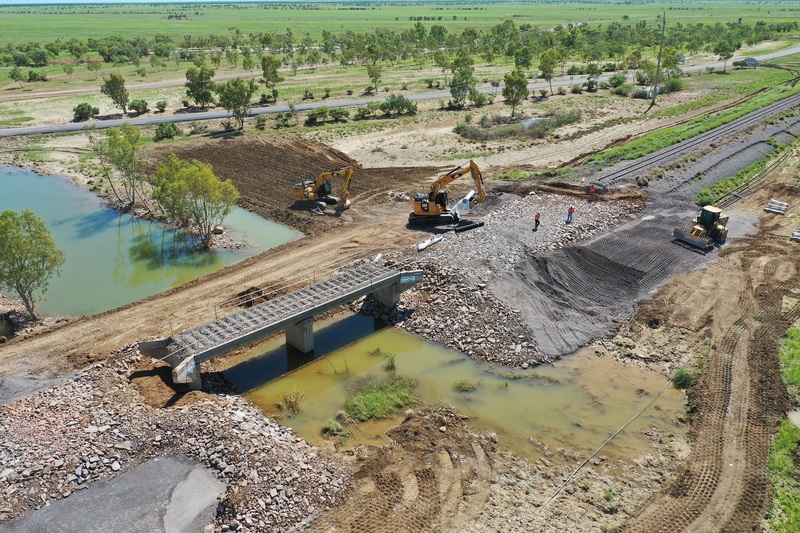 Mr Easy said ongoing repair and recovery works for the remaining damaged section between Richmond and Cloncurry were on track, with crews progressively working from both east and west. “We remain on track to reopen the entire Mount Isa Line between late-April and Mid-May, subject to construction and weather conditions. Mr Easy said with more than 400 Queensland Rail employees and contractors to be mobilised to Julia Creek and Richmond to accelerate the repair and recovery work, Queensland Rail had partnered with the Department of Public Works and Housing to establish workers camps at Richmond and Julia Creek. “A 60-bed camp is being established in Richmond to accommodate employees and contractors working on the recovery and another 120-bed camp will also be set up in Julia Creek to accommodate recovery works at Nelia,” Mr Easy said. “Accommodation presented a significant challenge for the recovery work, but now that a solution has been identified and is being implemented, the Taskforce is confident it can mobilise all of the crews and contractors required to accelerate the recovery program. “Local contractors have been engaged to transport mobile, stackable buildings on trailers which will house workers unable to be accommodated in local motels and caravan parks and local suppliers in each town will also be hired to provide food, cleaning and supplies to the camps.